William Badke is Associate Librarian for at Associated Canadian Theological Schools and information literacy at Trinity Western University. Beyond his widely used textbook, Research Strategies (6th edition, 2017), he is also the author of a book on academic success for international students, a book on the environment, four novels, and a book-length guide to the meaning of everything. 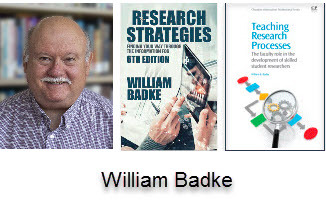 His book, Teaching Research Processes: The Faculty Role in the Development of Skilled Student Researchers, was released February 2012 from Elsevier/Chandos Publishing. Since 2007, he has written the InfoLit Land column for Online, Online Searcher. For the past more than three decades, he has been actively involved in training both undergraduates and graduate students in the delights of research.